The ways we extract and interpret the data that matters to us, and our business, are becoming more difficult. Contact center analytics have been proven to be a powerful front line tool for organizations to get an overall pulse on their customer base. Firms regularly rely on this data to reveal pertinent business information in real-time. 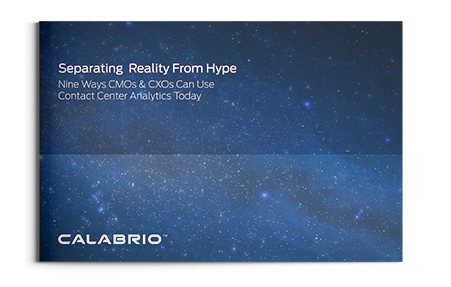 Download Separating Reality from Hype to learn Nine ways CMOs & CXOs should use contact center analytics to stay ahead of the curve.